Let´s say welcome on the Philippines, AGAIN! George Casem, the owner of McKenzie Fingerboards, sents me a wonderful letter filled with happines from one of more than 7000 islands of the Philippines. George is in the fingerboard game since 2012 so he knows how to roll. The shape of this deck is the GU Shape in a width of 33mm. The GU shape is a well-defined medium kick and medium concave fingerboard shape. The tail is shorter than the nose and the nose is about 1 degree higher than the tail. 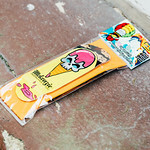 This graphic is called “Ice Cream 2”. I think is is just a toooo basic name for this deck so I called it the “Acid Ice”. Just because of this little look of acid combined with some skull and ice. This deck is a real wear graphic deck. The last ones were made with some sort of paper graphic, now you have the real wear foil for a more realistic look. The graphic is really colorful and I like the comic style of this ice. The graphic is done perfect on the fingerboard deck. I rally like the fact that you can see the wood of the bottom ply because there are transparent parts in the real wear foil. Thats a nice mix! This deck and all the plies are just super clean. The color of the graphic are just super strong and fantastic! The edges are perfect round and the holes are straight and just perfect. 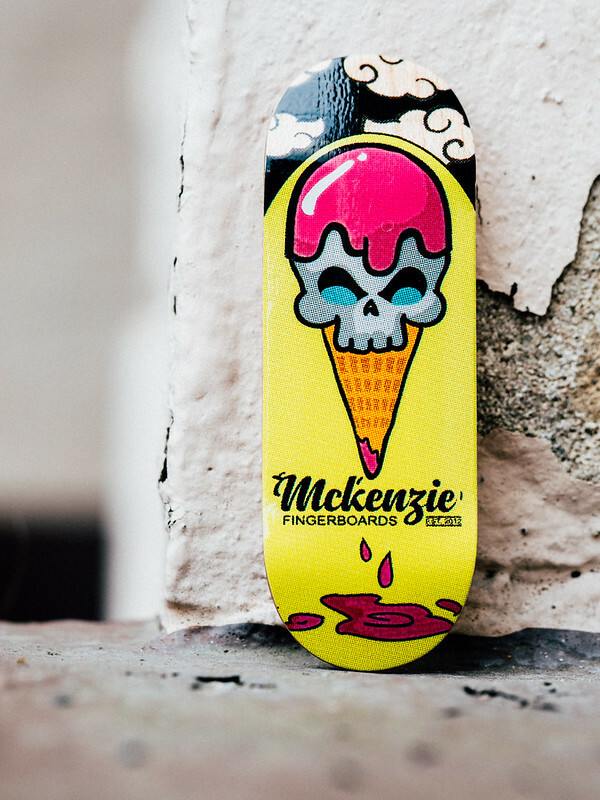 This is just a perfect graphic fingerboard deck. I mean, just look at the pictures. This is a super high quality fingerboard. 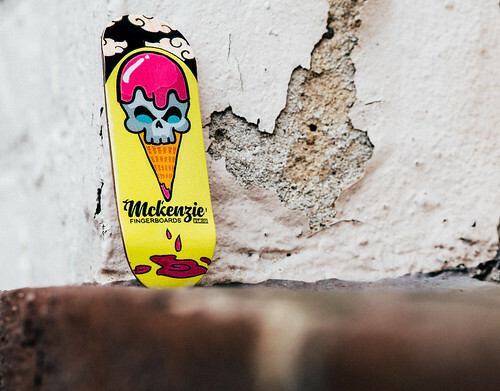 The McKenzie decks from last year have been made in a super high quality but this deck is another step in the evolution of McKenzie. You can really see how much love was given to this deck. 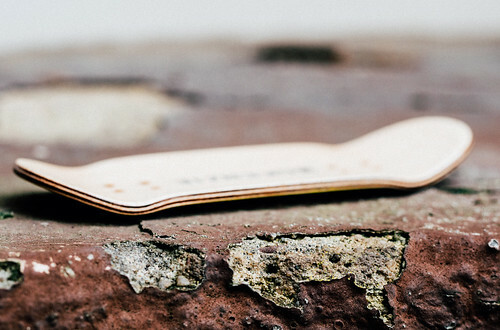 The shape of this deck is the GU Shape in a width of 33mm. 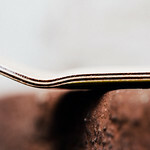 The GU shape is a well-defined medium kick and medium concave fingerboard shape. The tail is shorter than the nose and the nose is about 1 degree higher than the tail. This shape is 100% up to date and fits perfect into these days standard. The plies are lovely, clean and basic too. Every deck comes in a basic package with some sticker, a sheet of colored foam and now with a sheet of riptape. This sheet of colored foam is without tape on the back, so it´s not a sheet of riptape. It´s probably in the package to keep the deck safe while shipping!? I don´t know. Just get some tape and use this foam as nonslider for example. The riptape is simply black an clean. 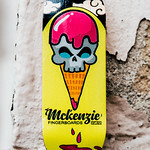 Goerge offers with McKenzie really affordable and really good fingerboard decks. The real wear graphic decks cost about 27 $. You could order this graphic right over here: Click! You don´t like this graphic? Well, a lot others are available too. You won´t regret buying a deck from George! THX a lot for this huge package George again. I really appreciate the love you give to fingerboarding. The next product blog will be up really soon.